On July 1, Canada announced the implementation of tariffs on C$16.6 billion (US$12.7 billion) worth of US-produced steel and aluminum products – a category that encompasses “doors, windows and their frames and thresholds for doors”. According to the Canadian government, the countermeasures “will remain in place until the US eliminates trade-restrictive measures against Canadian steel and aluminum products”. These retaliatory tariffs came into effect a month after the Trump administration’s imposition of 10% duties on steel and aluminum products exported into the US from Canada. These tariffs, intended to provide a boost to the US aluminum sector, have been met with wide criticism due to concerns that they will increase costs for domestic companies using imported steel and aluminum products in the manufacture of their goods. The US and Canadian fenestration industries have long aligned their window and door requirements, using performance testing established by the American Architectural Manufacturers Association (AAMA), the Window & Door Manufacturers Association (WDMA), and the Canadian Standards Association (CSA). Both also participate in the National Fenestration Rating Council (NFRC) Product Certification Program. While regional variations in code requirements exist – including the Canadian Supplement to the AAMA 101 standard (applicable only to windows and doors used in Canada) and windborne debris testing for products sold in high velocity hurricane zones (HVHZ) in the US – a shared set of base standards facilitates cross-border trade. Participants in the US and Canadian window and door industries have criticized the tariffs implemented by both countries, arguing that such actions will contribute to even higher building construction costs. Manufacturers of windows and doors that use imported metal components will now face higher prices, which they are expected to pass along to consumers. These tensions come at a time when the US construction sector is already facing price hikes due to the trade dispute over softwood lumber; the 20.83% duty levied by the US on Canadian softwood imports in November 2017 is expected to lead to a 7% increase in the cost of new home construction in the US. The affordability of new housing in the US sank to a 10-year low in the second quarter of 2018, according to the National Association of Home Builders, due in part to rising building material costs. Facing further price hikes, window and door manufacturers in both countries will hope for a swift resolution to the trade dispute. 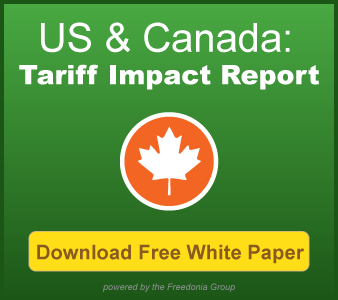 Looking for more information about tariffs between the US and Canada? Download the Freedonia Group's new white paper for the latest insights from experts. Carolyn Zulandt is an Industry Analyst at the Freedonia Group, where her work covers topics related to the US and Global Construction and Building Products markets.